On Sunday, April 1, SANA, the Syrian Arab News Agency, reported "Directorate-General for Antiquities and Museums: World Heritage Sites in Syria Suffered Attacks by Terrorists". On the same day, CBS News Correspondent Clarrisa War reported that U. S. Secretary of State Hillary Clinton met with delegates from 70 countries at a meeting in Istanbul to "support the opposition" [or what the Syrian government calls "terrorists"] to the government of Syrian President Bashar Al Assad. CBS News has reported that the U. S. pledges $12 million to Syria's rebels and reports that the Syrian Regime won't back down. According to Bloomberg News today, a "United Nations team is headed to Damascas to discuss deploying unarmed peacekeepers after the Syrian president agreed to an April 10 cease-fire." According to SANA's online report, the world heritage sites in Damascus (the Ancient City of Damascus), Aleppo, Old Bosra, Palmyra, Citadel of Saladin, and Crac des Chevaliers were "targeted by the terrorist groups." Palmyra also has a sacred site, The Temple of Bel, in honor of the Babylonian god Bel-Marduk. Since early March, archaeologists, government officials and Syrian expatriates have been alarmed at the threat to cultural property sites in Syria after more than a year of civil conflict. UNESCO has issued a request to the Syrian authorities to protect their cultural heritage in accordance with the international cultural property protection conventions they have signed since 1954. 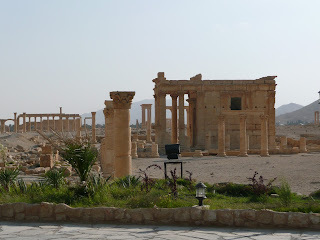 Global Heritage Fund blogged on March 5, 2012 that the Syrian army was attacking Palmyra's Roman Ruins. 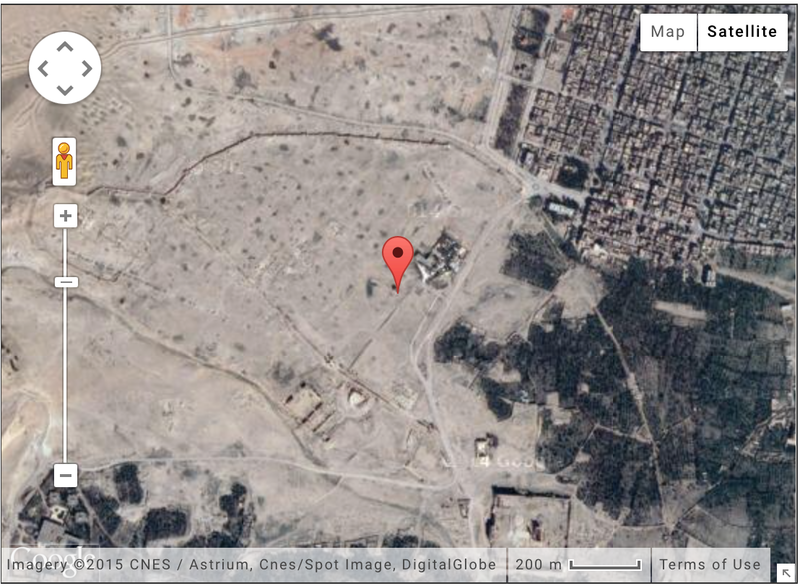 According to the report, the Syrian army has set itself up in a hilltop citadel and firing into the ancient ruins. Palmyra, located about 200 kilometers northeast of Damascus, an ancient Roman trading center accommodating caravans between Persia and the Mediterranean countries flourished in the 1st through the 3rd centuries. It was one of the most important cultural centers of the ancient world. It is a national monument and since 1980 included on UNESCO's World Heritage list. According to the Global Heritage Network, "Protestors have made use of this UNESCO World Heritage Site during recent protests on December 30th of 2011. On March 24, Popular Archaeology wrote in "Leaked Government Memo Warns of Organized Looting in Syria" that government is concerned that the current civil conflict in Syria will increase damage and theft from archaeological sites. 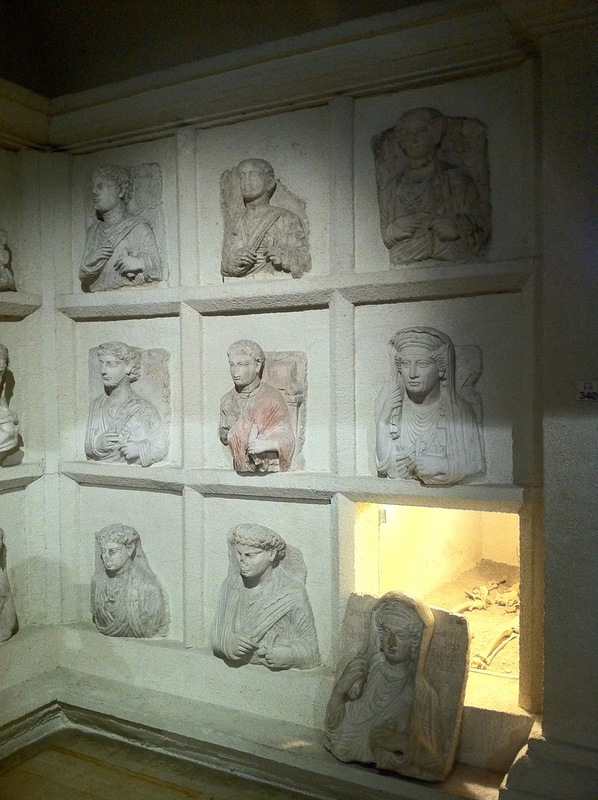 Syria has 25 antiquities museums throughout the country near the original excavation sites. 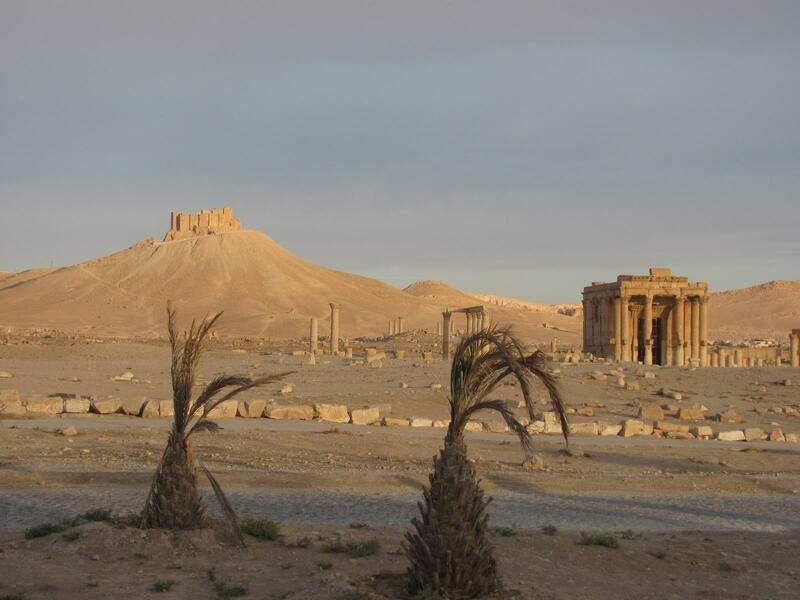 Kate Deimling for ARTINFO France reported March 27th that Syrian activists had appealed to UNESCO for financial aid to protect the country's ancient sites. One archaeologist reported that looting "takes place in the form of direct attacks on specific sites or clandestine searches of in storehouses holding historic pieces." "The Syrian Expatriates Organization (SEO) is disturbed by the Assad regime's deliberate destruction and failure to preserve Syria's great archaeological sites and ancient antiquities," according to a press release dated March 28. SEO asked that UNESCO issue a statement "condemning the Syrian government's actions regarding the potential loss of cultural property and for help in assessing the damage "as soon as the situation allows". Earlier this year, UNESCO alerted the Syrian authorities, through their representative at UNESCO, about their responsibility to ensure the protection of cultural heritage. 'This situation is becoming more crucial by the hour,' stated the Director-General. 'I urge the Syrian authorities to respect the international conventions they have signed, in particular the 1954 Convention for the Protection of Cultural Properties in the Event of Armed Conflict, the Convention on the Means of Prohibiting and Preventing the Illicit Import, Export and Transfer of Ownership of Cultural Property (1970), and the 1972 World Heritage Convention. In the framework of the 1970 Convention, the Director-General has already contacted the World Customs Organization, INTERPOL, and the specialized heritage police of France and Italy to alert them to objects from Syria that could appear on the international antiquities market. She has also called for the mobilization of all UNESCO's partners to ensure the safeguarding of this heritage. The photos (by Catherine Sezgin) published here are second century funeral monuments from Palmyra on permanent display in January at Istanbul's Archaeological Museum. 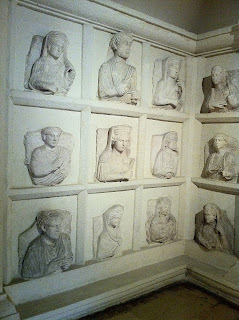 Today's afternoon story in The New York Times, "Fighting in Syria Escalates as Opposition Rejects Russian Plan" reminds me of the beautiful funeral monuments I saw earlier this month on display from Palmyra, Syria, at the Istanbul Archaeological Museum. 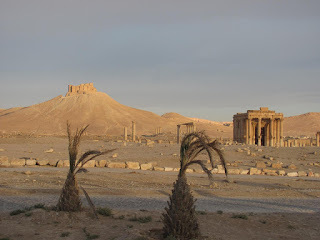 Palmyra, located more than 200 kilometers northeast of Damascus, was a thriving Roman city in the First, Second and Third Centuries AD, a midpoint for caravan traders between Persia and the Mediterranean. In 108 AD, a rich Palmyrene named Yarhai, used limestone blocks to construct tombs for 219 people. More than 100 people were interned in this one kilometer long necropolis called the Valley of the Tombs over 130 years. Burial slots were designed as drawers stacked in up to six rows, similar to the Panthéon in Paris or even the mausoleum at Our Lady of Angels, the contemporary Roman Catholic Cathedral in Los Angeles. The exciting feature is that the deceased were represented by sculptural portraits projecting from the surface of the graves, giving "the impression of looking out of a window" (Istanbul Archaeological Museum placard). Inscriptions in Ancient Greek and the language of Palmyra (Aramaean and Arabic) on one-third of the tombs reveal "the identity of the person who has ordered the tomb to be built; the common tombs shared by the family or the relatives; and the distribution of the tombs in the 1st-3rd centuries AD" (Istanbul Archaeological Museum placard). Merchants, army commanders and high ranking officials and priests of Palmyra were buried in these tombs (Istanbul Archaeological Museum placard). The original reliefs on display at Istanbul's Archaeological Museum were separated from their tombs and are arranged according to their style and chronologically (Istanbul Archaeological Museum placard). Two of the reliefs are related, one is of "ABD' Astor and his son Maqqai and the other is of his daughter Salmat and her daughter Hagge. As with many of the objects in the Istanbul Archaeology Museum, I am humbled by their beauty and have an increased awareness of the tenacity of the Syrian people. You may read more about Palmyra and its history here at UNESCO's World Heritage Site page. The city thrived until the 16th century. Other funerary art from Palmyra may be found at the British Museum. Here's the page on the website of the Istabul Archaeological Museum on the Palmyran Tomb Chamber.